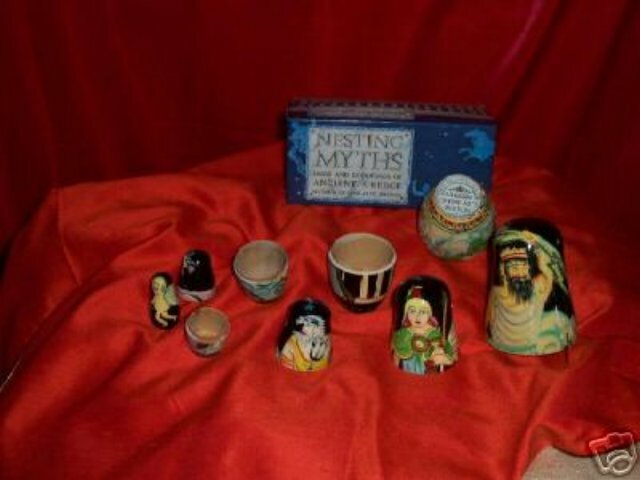 These are 1992 Nesting Dolls called the "Nesting Myths" Gods and Goddesses of Ancient Greece. They are from the Boston Museum of Fine Arts. It has 5 dolls and comes in a box that explains that they are Nesting Myths, Gods and Goddesses of Ancient Greece - Zeus, Athena, Poseidon, Aphrodite and Eros. Zeus, the biggest one is 6 inches high.